Peter Costello is a Company Director and a Corporate Advisor with the boutique firm ECG Financial Pty Ltd which advises on mergers and acquisitions, foreign investment, competition and regulatory issues. 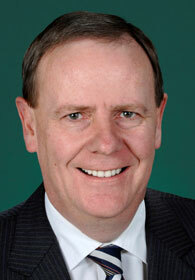 Peter Costello was elected a Member of the Australian House of Representatives for the seat of Higgins in March 1990 and re-elected on six subsequent occasions. Mr Costello was elected Deputy Leader of the Liberal Party of Australia in May 1994 and served in that post to November 2007. He was Treasurer of the Commonwealth of Australia from 11 March 1996 to 3 December 2007, the longest serving Treasurer in Australia’s history. Peter Costello brought down twelve consecutive Federal Budgets, including ten surpluses. During that period he eliminated Commonwealth Government debt in net terms. Australia's credit rating was upgraded twice to AAA. Peter Costello introduced the largest tax reform in Australian history called: A New Tax System, which introduced GST, abolished seven taxes and reduced income, capital gains and company taxes. After leaving Parliament Mr Costello served as Member and then Chairman of the Independent Advisory Board to the World Bank in Washington 2009-2014. Mr Costello is Chairman of the Australian Future Fund now holding around $130 billion in assets. Mr Costello is Chairman of the Nine Entertainment Corporation, a public company that provides media and entertainment. In January 2011 he was made a Companion (AC) in the Order of Australia. His best-selling memoir was published in 2008 by Melbourne University Press. Peter is married to Tanya and they have three children. Peter holds degrees from Monash University BA, LLB (Hons), LLD (Honoris Causa). Prior to entering Parliament he was a Barrister and Counsel in some of Australia's best-known industrial disputes. His favourite activity is cooking on the barbeque at home (badly) and following his beloved football team (passionately).